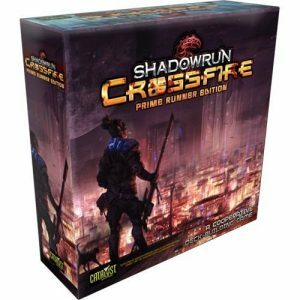 Shadowrun Crossfire is a deck-building game set in the Shadowrun universe, developed by Gregory Marques, Mike Elliott, Rob Heinsoo, James “Jim” Lin, Sean McCarthy, and Rob Watkins and published by Catalyst Game Labs. Crossfire is a cooperative deck-building game for the Shadowrun universe, optimally designed for four players, but scaleable from 1-6. This particular edition, the Prime Runner Edition, contains additional cards, updated character card format, and revised rules. It contains a quick rules set for playing single games along with a full rules set for playing campaign-style games. The game is not only set in the Shadowrun universe, but uses the fantasy cyberpunk style of Shadowrun to guide the mechanics. It also incorporates elements of the Shadowrun RPG by creating characters akin to what you’d create for the RPG. However, to stick to the fact it’s a card game, those characters maintain a maximum amount of flexibility that allows each one to take full advantage of the game’s mechanics. Throughout the course of gameplay, players work together to defeat the challenges that are laid before them. Like all deck-building games, you start with a minimal amount of cards and the purpose is to increase the power of your deck through continued gameplay to defeat the more difficult challenges the players face as the game progresses. You draw a hand, play your cards, and shuffle through the discards to start the process again. And that’s Crossfire on the surface. Ever since the success of the Pathfinder Adventure Card Game, the concept of adventure card games has been applied to new settings and various game mechanics. Shadowrun Crossfire combines the adventure card game concept with a cooperative deck-building mechanic to create a game that can be played as single shots or campaigns, expandable or used as is, and for 1-6 players. At the same time, it wraps the canon of Shadowrun into the game along with paying homage to the Shadowrun RPG through content, concept, and appearance. The basic mechanics of the card game could be applied elsewhere, but instead the Shadowrun universe is threaded throughout to create a more interesting concept with a setting that is both familiar and desirable. In other words, Shadowrun Crossfire does an amazing job of blending card game and role-playing game into a single offering (and without those massive dice pools). So what about game play? Well, it’s definitely not a game that can be played with casual gamers. It requires you to pay much more attention to what you’re doing so that you fully understand how turn play functions and how to win each step of the game (called obstacles in game, requiring you to play cards against an obstacle to defeat it). The game also has a bit of a learning curve, but once you get going it can move along quickly. It’s also important that you remember it’s a deck-building game and you need to continually build your deck up as levels progress so that you can defeat those harder obstacles. Of course, you get all the amazing Shadowrun flavor to go with your gameplay, which truly enhance the game in many ways; it is aesthetically pleasing! As a deck-building game, you already get good re-playability due to the randomness of card games and your choices of how you play your cards (and which Shadowrun character-type you want to play). As an adventure card game (campaign-style gameplay), you get re-playability in the form of add-ons which include new character roles, equipment, missions, and obstacles. I hate to say this, but I can see the base mechanics and concepts for this game being applied to other settings and having it turn out amazing! It’s such an all-in-one experience that you definitely get your money’s worth!